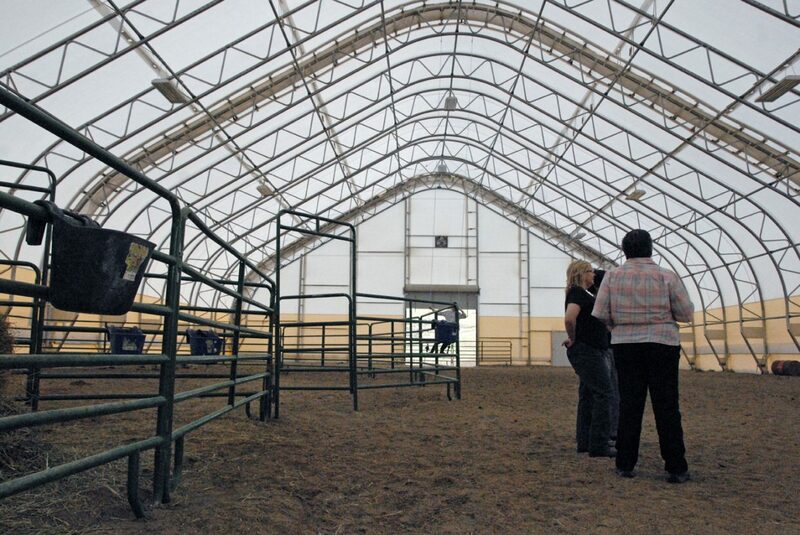 This horse arena, located at the residence of Dr. Scott and Connie Sue Ellis east of downtown Craig, could be the future site of a therapeutic horse riding center. Nine Yampa Valley residents met Sunday night at the Ellis home to discuss ways to get a local therapeutic horse riding organization established in Craig. Nine Yampa Valley residents met early Sunday night at the residence of Dr. Scott and Connie Sue Ellis to discuss the feasibility of developing a therapeutic riding center in Craig. The meeting was organized by Joan Heinz, who has a bachelor’s degree in therapeutic riding and more than 10 years of experience as a Professional Association of Therapeutic Horsemanship instructor. Heinz also works as a children’s service coordinator with Horizons Specialized Services and serves on the Connections 4 Kids Board. Therapeutic horse riding serves a number of different functions, Heinz said, and can benefit people of all ages suffering from a variety of physical, psychological and cognitive challenges. Horses also tend to have a “hugely beneficial” effect on at risk youths, Heinz said. The purpose of the first meeting was to brainstorm ideas, discuss available resources and decide what kind of an organization the group would ultimately want to establish. As far as resources, Connie Sue Ellis said her participation includes providing her horses, stable and horse arena for the potential project. The group also discussed developing articles of incorporation, being a for-profit versus a nonprofit organization, building a business plan, raising funds and what types of programs they envision the organization providing. Although developmental preschools, Horizons and the Boys & Girls Club of Northwest Colorado were all considered obvious partners, Craig resident Jane Hendricks wanted to make sure the group didn’t overlook Northwest Colorado’s veteran population. Hendricks said she’s witnessed firsthand not just the physical benefits horses provide returning soldiers, but also the psychological benefits for those struggling with Post Traumatic Stress Disorder. “These guys come back and they may not be in bad shape physically, but they have seen things you and I couldn’t even imagine,” Hendricks said. “I was working with a Marine who recently returned from duty and he was quiet as a mouse. The local therapeutic horse riding group is looking for Yampa Valley attorneys, marketing professionals, doctors and business professionals who are interested in donating their time to help get the organization established. The group meets again at 2:30 p.m. June 13 at the Ellis home. For more information, call Heinz at 701-9085.